In this category you can find a selection of feminized seeds direct from the breeder himself for reasonable prices to buy the highest quality genetics. De strains are all made by Sannie and Knutsel with the best selection plants we have in our plant library. All our feminized seeds are made from two different pheno type's from regular seeds. 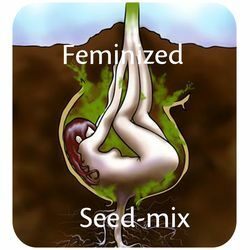 This ensures the strongest feminized seeds as close by nature as possible. Years of strong selections and strain improvements makes sure you have the best female plants without the need to get rit of males. For communication about sannie strains you can contact the breeder Sannie for all questions.